Have you heard of Santa's Choice? All the Best Brands to create perfect Holiday meals! Santas Choice only chooses the top quality brands so you can serve your favourites at your table. Butterball Turkeys, Cadbury Milk Tray Chocolates, Sara Lee Pies, Schneider’s Ham… everything you need for the family Christmas! 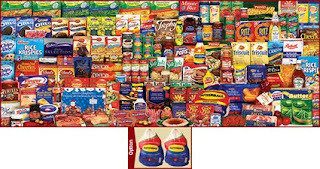 Santas Choice gives you the opportunity to put your Christmas Groceries and Gifts on layaway, and at today’s prices. Gerry and I have been with this program from day 1 and get these packs every year. What we don't use for ourselves is shared with our family or the food bank.We really enjoy receiving these boxes filled with food every year, that help us fill our cupboards during the holidays. Not only do they have food but toys and gifts as well.Free catalogues can be ordered off their web site, and if you do any ordering, please quote my customer # 26280. I am an agent and can receive a small commission in the new year, from any orders placed.